I really enjoyed this one. I think I should read more science fiction. I don't have the same problems with this genre as I do with fantasy. I am having a great time re-reading these Sarah Dessen books. Since I won't get to all of them this summer, I've decided to focus on the ones set in Colby, and it has been fun seeing all the connections between the characters. My review of this book is on Goodreads. I saw this book on Instagram and borrowed it from Open Library. It was interesting and different than I was expecting, and now I want to read more books by this author. I loved the writing and the character development in this book, but the plot was very thin and predictable. It is set at the beach, though, so it was a good choice for a summer read. 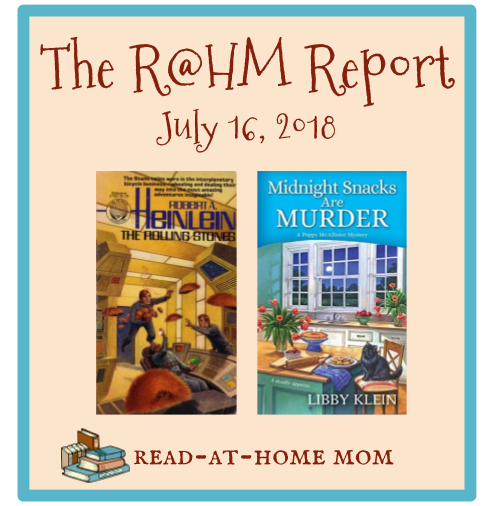 I had a hard time getting into this cozy mystery to the point that I considered marking it DNF around the 40% mark. But things picked up a lot at the halfway mark, and I wound up reading the remaining 60% in less than two hours. I'll be reviewing this one on Goodreads and NetGalley. I was just not in the mood for this book this week and didn't read a single page. I feel like it might be a good one to take to the pool if we take the girls this week. I jumped right into another Sarah Dessen book literally 2 minutes after finishing Along for the Ride. I have enjoyed all the audiobook narrators I've heard so far, but I think Allie Gallerani is my favorite. She sounds exactly like I would expect Emaline to sound, and her voice still sounds normal even when I listen at 2x speed. Book club is Thursday, so this book is the priority for the next couple of days. I'm enjoying it, so unlike the last couple book club books, I am sure I will finish it. I'm so glad you brought up Sarah Dessen books. My daughter has been looking for some new reading material and I think she and I might enjoy reading these together and discussing. I'm also glad to hear I'm not the only one who speeds up my audiobooks. Some sound awful at 2x, but I'm always excited when the voice doesn't sound too ridiculous because all the pauses and slow narration drives me bonkers. LOL Have a wonderful reading week, Katie! I've had a few cozies lately that took awhile for me to get into. I was attributing it to my reading mood. But maybe it's just the cozies I'm picking... It's good to hear this one picked up for you. I read one Sarah Dessen book and didn’t like it. I was always going to try another to see what all the hype is about. I haven’t done it yet because there are so many books and so little time! Have a great week! I've read a few Sarah Dessen books, and even enjoyed them, but there are so many books to read! I liked the Rolling Stones when I was a kid. Have Spacesuit Will Travel was another fun one by Heinlein.